We live in a day where the tragic reports of public killings, such as school shootings and work place violence are far to common. Valdez PD acknowledged that traditional approaches and tactics have not done their jobs to save lives and protect citizens. 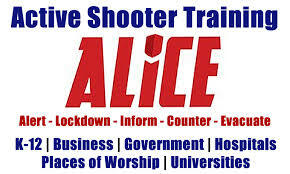 In an effort to provided a proactive, life saving tool to our citizens, the Valdez PD discovered the ALICE Training Institute which is endorsed by many other local, State and Federal agencies as a tool for survival. The Valdez PD is actively involved in training these tools for survival to the Valdez School District, Providence Valdez Medical Center, Prince William Sound Community College as well as many other local and State government agencies and local businesses and private citizens. Contact the Valdez PD to learn more about upcoming training opportunities or to schedule your own, at 907-835-4560. From our beginning as a small school safety company, we have been dedicated to promoting proactive strategies to improve the chances of survival during an active shooter event. We’ve worked with thousands of people in the higher education, K-12, professional, corporate, and government organizations allowing them to empower their people using ALICE. Our drive to make a difference and continue to lead the evolution in active shooter response education is at the core of what makes our solutions so effective. At the ALICE Training Institute, we’re always working to create new stories of improvement. From teachers and administrators to students and parents, we teach skills that improve your chances of survival anywhere you go in life. The threat of an active shooter attack is rare but very real. We aim to eradicate the “It can’t happen to me” mentality and change the way people in schools, universities, businesses, hospitals and places of worship respond to armed intruders. At the ALICE Training Institute, we believe everyone deserves access to life-saving options. We want all Americans to have the knowledge and skills to survive when shots are fired. By training as many people as possible and implementing training in drill form in the K-12 setting, we can accomplish that. We have seen the results of fire drills. It’s time to start anticipating man made disasters.